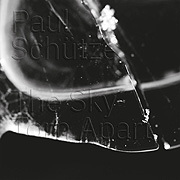 The creative spirit of Paul Schütze has been proven undimmed by time. His release The Sky Torn Apart (56'40") speaks an unabridged truth. Meant to be spun during the final act of the fragile theatre of civilization, this CD provides a finely rendered final trek across a desperate post-apocalyptic panorama. Becoming lost in this technologically assisted dream we confront underworld demons, magnetized clouds and contradictory yearnings. Opening with a mythic power, we soon find The Sky Torn Apart to be structured with the precision of the very best poetry. The sense of some kind of ongoing journey is clear, however immense, dense, complex, strange and disorienting a journey it is. Though indeed extraordinarily rendered and ambitiously crafted, we will need to search hard for ourselves in this soundscape. Through an undefined space, weak ceremonial blasts resound and recur, and lead us beneath thick, languid skies. In its slow continuous advance droning electronic tones expand and recede in studied synthesized breaths. This interchange with a sighing atmosphere provides sonification of the composer's vivid idea of the future. As the conclusion of The Sky Torn Apart approaches, its center of gravity shifts - to points so minimal that the work may not sustain concentrated listening in service of a continuous narrative. Resounding like a whisper in the ruins the soundfield transforms slightly, from ascetical and bleak to a passage of stillness and certainty. Taking place in the private sphere of the imagination this realization involves risk, for the listener and the musician alike. Schütze uses his creative engine to disrupt mental grooves with an interrogation, a questioning about mankind's subsumption of The Earth. It is already too late to avert the slow environmental disaster that besets our future - and the ugly society that will be spawned. Schütze is attuned with his listener's anguish, as he addresses the fated of coming times. This work might help them to understand why we destroyed their world - and to ask as well if they could have done any better.